A Park Forest (IL) police officer who was shot in the line of duty is heading home Friday one year after being shot in the head. It’s been a long time coming for Tim Jones and his family. 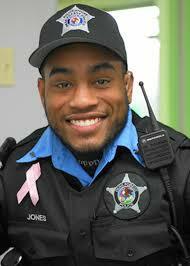 It was a wonderful send off for Officer Jones. He was surrounded by his doctors, family and Park Forest police officers. He still has a long way to go for recovery. He’s in a wheelchair and talking is difficult for him. But he is now on his way home after seven months at the Marianjoy rehabilitation hospital and months before that in intensive care. The 25-year-old was shot in the head on March 19, 2016 while responding to a burglary. He had been on the police force less than a year. His father, who is the police chief of Country Club Hills has been at his son’s side since the day of the shooting providing updates to the community and the police chief. Jones’ doctors and nurses at the hospital said he has drastically improved in the seven months he’s been a patient there. I’m so happy to hear Tim is going home. I pray daily for all the injured and LODD officers and their families. I don’t know if it was his youth, short time on the job, or his brilliant smile, but his injury touched me deeper than most. May his healing continue. I hope he is one day able to return to his job.